The HMD camera component represents a head mounted display (HMD) in a VR camera rig. When you attach an entity with an HMD camera component to a VR camera rig, users can use a VR headset to view the scene in VR mode. 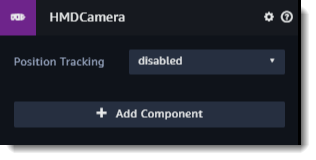 Position tracking – Set to Disabled to lock the camera's position, and only track the display's rotation. See Amazon Sumerian VR Camera Rig Component for more information.